There are many factors that go into choosing wedding bands. You will be faced with many choices, ranging from style to metal. You need to select a man’s band and a woman’s band that match each other perfectly. Decide whether you want to order the bands as part of a set or separately. 1. First, you need to choose a stone. Diamonds, of course, are the most popular choice. The question is, do you want diamonds to be the ONLY stone, or do you want them to be complemented with rubies, emeralds, or sapphires? These days, many men are going with black diamonds. Overall, men’s bands are less flashy than women’s. 2. Another thing you and your sweetheart must consider is the metal. Bands are generally available in white gold, yellow gold, titanium, tungsten, and platinum. Tungsten is a popular modern choice for men. If you would prefer classic styles, go with platinum, yellow gold, or white gold. In order to prevent wear and tear over time, go with the most durable metal and highest carat possible. 3. Compare widths and sizes. Make sure you choose the right size for your significant other so you won’t have to pay for adjustments later on. As for widths, men’s tend to be wide and women’s are thin. However, you don’t have to stick with the rules if you don’t want to. 4. In addition to size and width, you also need to consider your fit. Comfort-fit bands are becoming increasingly popular. These are contoured on the inside to allow the ring to slide over the finger easily. There are two types of comfort-fit rings: half-rounds and pipe-bands. Half-rounds are domed at the top, and pipe bands are flat. You’ll be wearing your wedding band all the time, so you need to make sure it fits as comfortable as possible. 5. Some men want something more than a simple band, but nothing TOO flashy. Perhaps a ring with ribbed edges or a satin finish texture would be ideal. Many men’s rings are a good combination of stylish and subtle. 6. Don’t be afraid to indulge your own individual style. You don’t have to settle with typical wedding bands. If you wear a lot of other jewelry, you might want to go with a two-tone band so that it can match different types of metal. There are also rings with bright colors and flashy accents. As long as you keep these tips in mind, the two of you should be able to find the perfect wedding bands. Good luck! 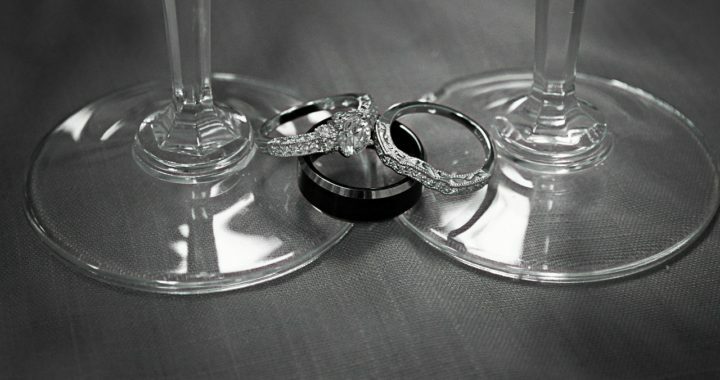 Now that you know what to look for in wedding bands, you can begin shopping for them at SuperJeweler.com. This online jewelry store offers the best wedding and anniversary rings at affordable prices. You can find all of the quality jewelry you could ever want at prices you can afford. A blue diamond ring makes an excellent gift. It represents love and commitment. Like all colored diamonds, blue diamonds get their color from chemical inclusions or defects in the lattice structure. Defects in the lattice structure don’t take away from the beauty of a colored diamond; in fact, they GIVE a diamond its color! Nitrogen is commonly found in these stones. The nitrogen replaces some of the carbon atoms in the crystal lattice. This gives the gemstones their tint. The value of the stone is determined by the level of color saturation provided by the tint. There are so many colored diamonds to choose from, and blue is the most popular. There is nothing like a lovely, icy, blue diamond ring. Any woman will appreciate receiving one as a gift. There are some styles for men as well. Keep in mind that they can be quite pricey! This is because natural blue diamonds are very, very rare. If you want a natural one, expect to pay extra for the value. A lab created blue stone is a cheaper alternative, but not nearly as exotic. Most of the blue diamonds you see on sale today are actually yellow diamonds that have been enhanced with laboratory produced irradiation. They can be cut into any shape imaginable: marquise, pear, heart, princess, emerald, asscher, brilliant round, etc. If you’re buying the ring as a gift, try to find out the recipient’s personal taste. For some people, the more brilliant the sparkle, the better. For others, there’s nothing more gorgeous like a sleek, clean cut. Another thing to consider is the carat. The stones range from less than 1 carat to several carats. Typically, a large stone is set as a solitaire, although it can have some tiny accents surrounding it. Three stone settings are also popular. The three stones don’t all have to be blue diamonds. You will find some settings consisting of blue diamonds and white or pink diamonds. Think about the style of ring. Do you want a blue diamond ring with a classic style or a modern style? Do you want a fancy ring or a subtle ring? For a classic style, go with an asscher, princess, or emerald cut. For a contemporary style, go with a brilliant round or heart shaped cut. An oval cut is a timeless choice that anybody can appreciate. Last but not least, what type of metal do you want the gem to be set in? Silver? White gold? Yellow gold? Rose gold? Platinum? Yellow and rose gold really add to the sparkle and dazzle of the blue diamond. Silver, white gold, and platinum are ideal if you want to go with a cool and sleek look. The best place to shop for a blue diamond ring is SuperJeweler.com! You can find great deals on not only rings, but blue diamond necklaces, earrings, and bracelets as well! 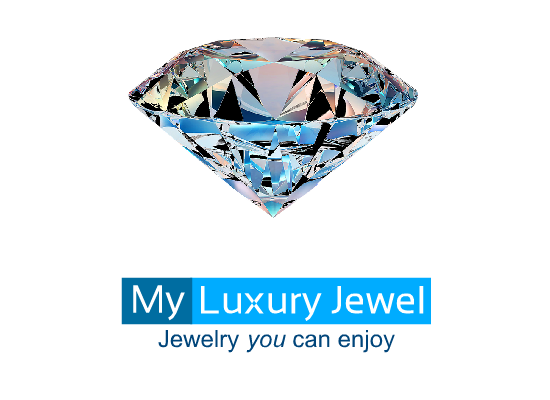 Super Jeweler is the #1 jewelry store on the internet. You can expect great prices and good customer service. Since you will be wearing your wedding bands for men for the rest of your lives, it’s important that you purchase the best ring possible. This is one investment in which you do not want to be cheap. It’s the one item from your wedding day that will stick with you with the rest of your life. Although men’s wedding bands tend to be more simplistic than women’s bands, overall, it’s still challenging to find the right one. They are available in every type of metal available. You need to choose a ring that will not only complement your sweetheart’s ring, but will symbolize your own lifestyle and personality. 1. First things first, choose the appropriate metal. Gold is the traditional choice, and it can be alloyed with other minerals to create rose gold or white gold. You can also choose from silver, platinum, and tungsten. Tungsten is a popular choice for men’s rings this day and age. If you want a ring that will complement other types of jewelry, including your watch, you might want to go with a two-tone ring. 2. Another thing to consider is whether you want a traditional style ring or a patterned ring. Traditional men’s bands have subtle decorative features, while modern bands can have more noticeable features such as textured finishes and patterned inlays. 3. Next, decide whether or not you want to go with any gemstones, and if so, how many. Diamonds are so flashy that they draw attention away from the metal. Dark gemstones, such as sapphires and black diamonds, enhance the overall appearance of the ring. If your lady has already picked out her ring, choose one that will complement it. 4. Make sure you choose the perfect fit. If you don’t wear rings very often, you need to make sure you measure your finger correctly. Never measure your finger first thing in the morning since you will be retaining water from the night before. Also, measure in a comfortable temperature – never when you are hot or cold. Take the final measurements in the afternoon when you are calm and your temperature is normal. 5. Speaking of the perfect fit, you will find that men’s wedding bands tend to be wider and thicker than women’s. It’s up to you how thick and wide you want yours to be – just make sure it complements her ring, and that it sits on your finger comfortably. As long as you follow these 5 guidelines, you should be able to find the perfect men’s wedding ring. If you want to order wedding bands for men online, make sure you do so from a trustworthy website that has a long history of selling wedding and engagement jewelry. The best online jewelry store is SuperJeweler.com. You can find discounts on wedding bands for men, special offers on wedding and anniversary sets, and more. At SuperJeweler, you will find quality metals and the best gemstones at reasonable prices. Are you looking for a bold ring that offers something “different”? Then maybe black diamond rings are what you’re looking for! While some would consider them to be unconventional, there is no denying that they are beautiful. They are available as fashion jewelry, engagement rings, casual rings, etc. Since their color is basically opaque, the 4 Cs don’t apply to them so much as they do with traditional, colorless diamonds. They are extremely durable, so you can trust that your ring will last for a long time. The stone can be set as a solitaire, three-stone, multi-stone, or as a center stone accented with diamonds. There are styles for men and women both. The black color is due to natural inclusions. They only occur naturally in Brazil and Central Africa. Geologists believe that they might even originate in space! This adds even more to their uniqueness and beauty. Keep in mind that a black diamond weighs a bit more than a colorless diamond, so 1-carat black diamonds are a little bit smaller than 1-carat colorless diamonds. High concentrations of inclusions cloud the diamond as it forms. The inclusions absorb light and give the stone its black metallic look. Keep in mind that it’s not unusual for black diamonds to have small surface inclusions. The inclusions are what give them their unique look. Ideally, go with a black diamond stone with 100% clarity. They are often crafted in sterling silver, platinum, or white gold. Sleek, cool metals bring out the coolness of the black color. However, some people still prefer rose gold or yellow gold, since these metals create a beautiful contrast with the sleek, black diamond. There are so many styles and cuts to choose from! How about a princess cut packed with dozens of bright pave-set gems surrounding a princess cut stone? Or maybe you want something contemporary. An example of a contemporary design is a solitaire stone in a crisscrossed 4 prong setting, placed in a white gold band. Other popular cuts include heart, emerald, and brilliant. For men, there are styles such as a sterling silver band covered in two rows of black pave diamonds. Some men prefer larger stones in a square or oval cut. A black rhodium plated design is also popular with men’s black diamond rings. They are fairly easy to take care of. You can start by pre-soaking the jewelry in hot water to loosen debris and oil. Mix up a colored diamond solution with water. You can make your own by mixing a tiny bit of diluted ammonia in a glass of water. Let it soak in the solution for an hour. Finally, rinse it off and dry it with a lint-free cloth. 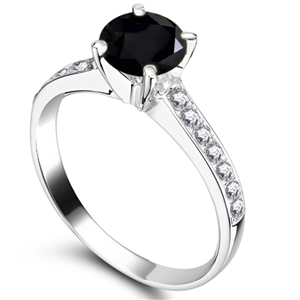 You can find tons of beautiful black diamond rings at SuperJeweler.com. This jewelry superstore offers amazing discounts on fine jewelry. You can get great deals on everything from black diamond rings to necklaces. The store offers a 60 day money back guarantee! Your ring won’t be the only piece of jewelry you’ll wear on your wedding day. There is other wedding jewelry to consider, such as earrings. It’s important that you plan ahead so that you aren’t stuck trying to find a few matching pieces at the last moment. You won’t want to wait until your wedding day to try the jewelry on, only to realize that it doesn’t look right with your dress. 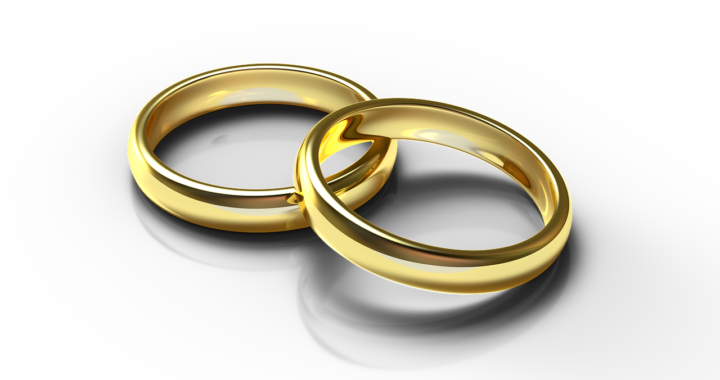 If you’ve already seen your wedding ring, ask the retailer if they can recommend any matching pieces for it. If nothing else, try to get an idea of what kind of earrings, bracelets, and necklaces to look for. 1. Not only should the jewelry match the wedding ring, it should also match your dress and overall style. If you want a traditional wedding, then go with a pair of vintage earrings. Also, nothing says tradition like a pearl necklace. The idea is to look – and be – glamorous. If you plan on wearing a modern wedding dress, you might want to go with a choker embellished in diamonds and huggie-style earrings. 2. Speaking of earrings, bigger is better. Stud earrings really aren’t the right choice for weddings since they will be overshadowed by your hair. You don’t want them to get overlooked by your gorgeous hairstyle. On the other hand, you don’t want them to overshadow your hair, either. There should be a good balance. 3. How do you know what kind of earrings to wear to go with your hair? Chunkier styles look better with upswept hair, whereas small bejeweled hoops tend to look great with a tiara or decorative veil. 4. You don’t want to over-accessorize OR under-accessorize. If your dress has a lot of heavy embroidery or lace, tone down the jewelry a tiny bit. Heavy jewelry and heavy embroidery will be too much when used together. 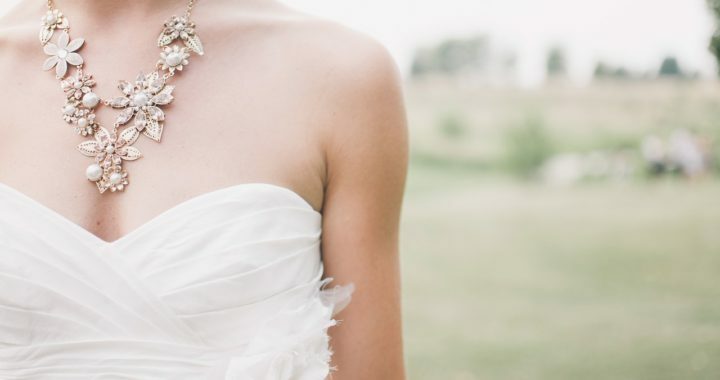 If your dress is simple and light, you can get away with wearing fancier jewelry pieces. 5. The type of necklace you should wear depends on the cut of your dress. If you’re wearing a strapless bodice, opt for a rhinestone or pearl choker. If your gown has a V cut, go with a diamond solitaire or a sweetheart necklace. 6. Harmonize your wedding jewelry with your headpiece and dress as best you can. As a general rule of thumb, pearls tend to complement beading, and diamonds go well with crystals or sequins. Now you have a starting point for your wedding jewelry. Keep these pointers in mind as you shop for the right pieces. You can find all of the wedding jewelry you need at SuperJeweler.com. Whether you need pearls, diamonds, hoop earrings, chokers, charm bracelets, or any other type of jewelry, you can expect some great deals at SuperJeweler. Up until recently, the average consumer wasn’t interested in black diamond jewelry. Now, this cool, dazzling gemstone is starting to become popular. 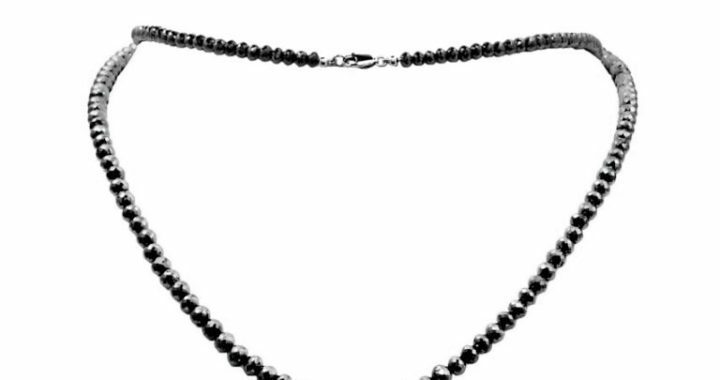 If you’re looking for a unique piece of jewelry, you might be interested in a black diamond necklace. It is simultaneously a subtle and bold piece of jewelry. This elusive gem gives off an almost mysterious vibe. It goes well with any type of outfit. Whether you want to wear something casual or dress up for a formal event, black diamonds will complement your outfit. Keep in mind that they can be costly – especially if the clarity is close to 100%. However, the investment is definitely worth every penny. Whether you want to buy the necklace for yourself or as a gift for somebody else, it will last for years and years. Black is the rarest of diamond colors. They are also younger than other diamonds. Some experts believe that they are formed as a result of a meteor crash. This means that the wearer can literally wear something that may have originated from space! This makes the gemstone even more appealing and unique. Whatever your taste, you can easily find a black diamond necklace that will suit your preferences. The designs vary from solitaire settings to intricately shaped pendants. Want something cute? Maybe a penguin necklace will suit your tastes. This cute design features dozens of small diamonds, in a mix of white and black, detailing a pendant shaped as a penguin. How about an angel feather wing? A feather wing pendant is made out of white and black diamonds. The pendant hangs on a shimming sterling silver chain. This is a very artsy and flashy necklace. If you prefer something simpler, then you will find plenty of necklaces with a solitaire black diamond stone. Sometimes there might be two or three stones placed in a column or row. Sometimes they have some small colorless stones or crystals surrounding them. Want something elegant and feminine? How about a black diamond “Riviera” necklace? This is one gorgeous necklace that complements that little black dress. Of course, it looks good with ANY outfit, including a black shirt and jeans. It’s a stunning piece that makes a versatile addition to any woman’s jewelry collection. Last but not least, you need to consider a classy design. You can find a classy design in an oval shaped black pendant hanging on a sterling silver chain. The oval pendant looks amazing with 48 pave set diamonds in round brilliant cut. Clearly, you have a lot to choose from in a black diamond necklace. Be sure to get a matching ring and pair of earrings! SuperJeweler.com offers a great selection of black diamond jewelry. You can find your ideal black diamond necklace at an affordable price. Super Jeweler offers excellent customer service and a 100% return guarantee! For the bride, the jewelry is just as important as the dress itself. Wedding jewelry sets can include the necklace, bracelets, earrings, tiara, and more. Some brides even pick out the jewelry they want their bridesmaids to wear. Whether you want to go with a classic pearl set, a diamond set, or sterling silver hair pieces, you can expect to pay a considerable amount of money. After all, it will be your big day, so you don’t want to wear anything cheap. Some jewelry stores sell wedding jewelry sets which include the necklace with a matching pair of earrings. Many brides find this to be an ideal option, since it’s usually cheaper to buy a set rather than pay for each piece individually. How do you know which bridal jewelry is for you? Well, do you already have an idea of how you want to look on your wedding day? The style of your dress dictates what kind of jewelry you should be wearing. If your dress sparkles, then a diamond necklace and earrings will accent it perfectly. If you plan on wearing a vintage style dress, go with an old-fashioned pearl necklace and matching earrings. Don’t forget your groom. Wedding jewelry sets can come with both the woman’s ring and the man’s ring. Many couples find it ideal to buy their rings as part of a set. When sold in a set, wedding bands are usually less expensive. The only problem is that the two of you will have to agree on a style and design. Once you get your ring and gown, you can begin to accessorize the rest of your jewelry. Even though you will want everything to match, you should still let your personality shine. Don’t neglect your own personality because you want to follow the rule book too much. Every bride should ad her own unique touch to her ensemble. Wear at least one piece of jewelry that you really want to wear, even if it’s slightly different than the rest of the ensemble. Also, keep in mind that it’s okay to add a bit of color to your wedding jewelry set. Some gowns look amazing when accented with gold or black rhinestone. If you’re wearing a dress with a V shaped neckline, you might want to go with a teardrop necklace featuring a dark rhinestone or garnet at the apex. There are so many ideas when it comes to wedding jewelry sets. As long as you don’t forget to incorporate a bit of your own personality, you should do fine. You can find great deals on entire sets on the internet. You can find some amazing wedding jewelry sets at SuperJeweler.com. There, you will find jewelry for yourself, your groom, and bridesmaids. Everything from the rings to necklaces are available at discount prices. Be sure to check out the clearance section! What makes the perfect engagement ring? Most people agree that diamonds are the best choice of a stone. These days, black diamonds are becoming a popular choice – especially among men. Black diamond engagement rings are typically set in sterling silver. They range in a variety of styles, including vintage, classic, contemporary, and gemstone halo. A gemstone halo includes a dazzling center stone surrounded by tiny gems. The reason why black diamonds are becoming so popular is because they are so unique. Since they have opaque or inky colors; the 4 Cs don’t necessarily apply to them as they do with traditional diamonds. The black color occurs through a graphite inclusion or enhancement through an irradiation process. They contain minerals such as magnetite and sulfide. So, how are they graded? It depends on the number of inclusions it has. The fewer inclusions, the better the clarity. The better the clarity, the more highly the stone is graded. The size should also be taken into consideration. A larger black diamond will obviously cost more than a smaller one with similar clarity. Typically, the higher the carat, the more pricey the stone. You should also consider the setting. Like colorless diamonds, black diamond engagement rings are available in pave settings, three stone settings, solitaire settings, tension settings, and settings with side-stones. The stones can be cut in a variety of shapes, with the most popular being ovals, hearts, spheres, and squares. The black represents the depths of your feelings and the unlimited possibilities of your life together. They might seem unconventional to some, but they are still unique and beautiful. They’re fairly easy to take care of. Just clean the stone regularly to keep it sparkling. • Presoak the diamond in hot water to loosen oil and dirt. • Mix it in a cleaning solution made of 75% water and 25% diluted ammonia. You can also buy a special diamond cleaning solution from a jewelry store. • Place it in a dish with the cleaning solution and let it soak for an hour. The stone must be completely submerged. • Scrub it with a soft bristle brush. A clean toothbrush is okay for this. Gently scrub the stone at different angles. • Place the diamond under running hot water to rinse the cleaning solution off. Polish it with a lint-free cloth. Last but not least, you will need to choose the metal in which the stone is set. Black diamond engagement rings can be set in silver, white gold, yellow gold, platinum, etc. Silver is the most popular choice since it enhances the sleekness of the black diamond. 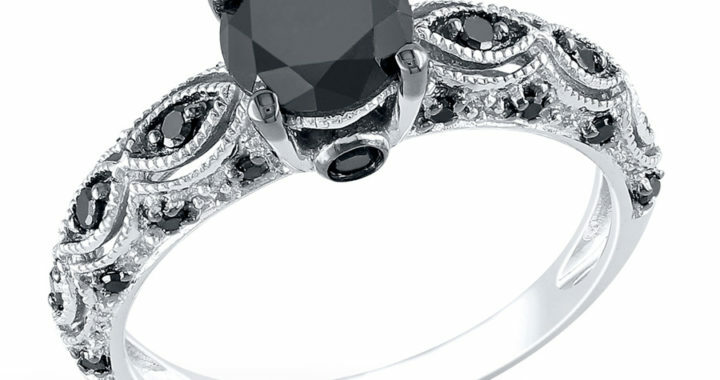 Check out SuperJeweler.com, and you will find tons of gorgeous black diamond engagement rings! Super Jeweler offers fast shipping and handling and a 60 day money back return. You can choose from a variety of stones in different cuts and settings. Blue topaz is a radiant color that makes it the perfect gemstone for jewelry! It has a serene tone which evokes thoughts of a clear blue sky on a sunny day, or of Caribbean waves splashing on a sandy beach. Any lady would love to have a blue topaz ring on her finger! Of course, men appreciate this gemstone as well. It’s found on jewelry pieces for women and men both. It’s not uncommon to see men wearing emerald or cushion cut blue topaz rings. The reason why they are so popular is because are elegant, yet not over-the-top flashy. It’s the perfect gift for an engagement or for someone who was born in December. Naturally occurring blue topaz is extremely rare. It’s typically gray in its natural form, and must be irradiated and heat treated to produce a darker blue. There are two different irradiation methods used. The first method involves the use of gamma rays from Cobalt 60 sources. The second method, which is used to produce darker tones of blue, uses electrons produced in a nuclear reactor. 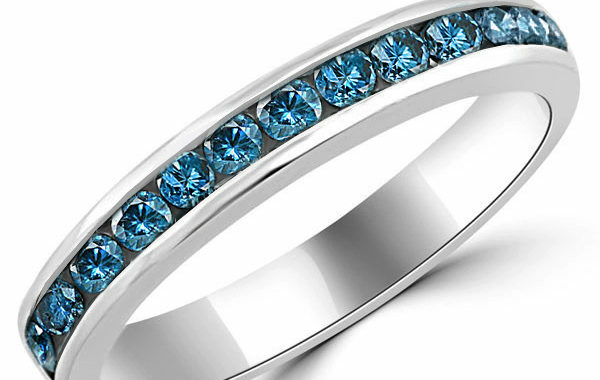 Now that you know a little bit about how blue topaz is treated, you can decide on the ring. As with any gemstone, you need to choose the clarity, cut, color, and carat. It’s a versatile stone, so it can be cut into the well-known gemstone shapes as well as unique ones. Emerald is one of the more popular shapes for blue topaz jewelry. Another thing to consider is whether or not you want a solitaire gemstone. Many people consider a solitaire blue topaz ring to be ideal since the gem is beautiful enough by itself and therefore doesn’t need to be embellished by diamonds or other stones. If you want a solitaire ring, your best bet is to choose one set in platinum or silver. When it comes to yellow gold, blue topaz looks best embellished with diamond accents. If you’d prefer a flashier ring featuring other gemstones, popular choices include diamonds, rubies, garnets, and pink topaz. The ideal size for the blue topaz is AT LEAST 2.75 carats. The colors range from pale, icy blue to a dark, almost sapphire blue. You always need to be careful when cleaning this stone. While it’s relatively hard, it’s still susceptible to chips and scratches. The best way to clean it is with a soft brush and soapy water. When not worn, the ring should be kept in a fabric-lined box AWAY from harder gemstones. Extreme temperature changes can also potentially harm blue topaz. Okay! Now that you know how to choose a perfect blue topaz ring, where can you buy it? 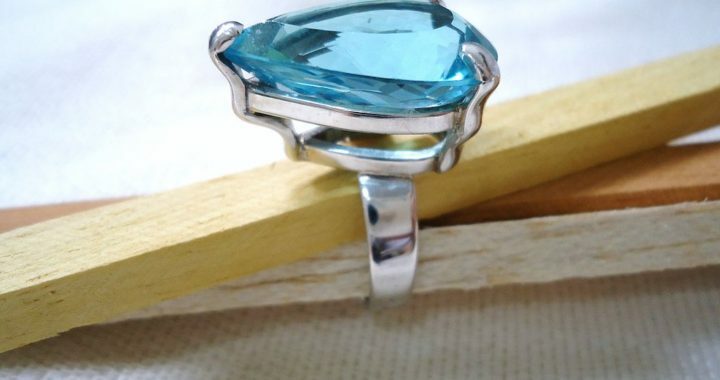 You can find blue topaz ring discounts at SuperJeweler.com! While you’re at it, check out some gorgeous necklaces, bracelets, and earrings. An emerald cut diamond ring is very classy. While it’s not as brilliant as a round cut, it’s still elegant with its long lines and dramatic flashes of light. This design was originally developed for emeralds, which are very difficult to cut into a certain shape. When the same cutting process is applied to diamonds, it creates trim lines and a sophisticated look. The only downside to diamonds with this kind of cut is that the flaws stand out more. This is why you need to be careful when shopping for one. You need to choose the highest quality diamond you can afford. Some of the rings include the diamond with accents. Tiny accents provide balance to the stone’s shape. The traditionally accepted ratio of the cut is 1:5:1, although some people prefer longer, thinner cuts. There are also short, fat cuts available. Emerald cuts were very popular in the Art Deco Era. While they’re not as popular more than a half a century later, they’re still considered classy choices. This cut isn’t fancy, but it is sophisticated and clean. It’s ideal for those who prefer a traditional look over a modern look. When Elizabeth Taylor and Mike Todd got engaged in the 1950s, he gave her a 29.4 carat emerald cut ring. She jokingly called it her “ice skating rink”. Indeed, that’s what it looked like. It shouldn’t be confused with a square cut. 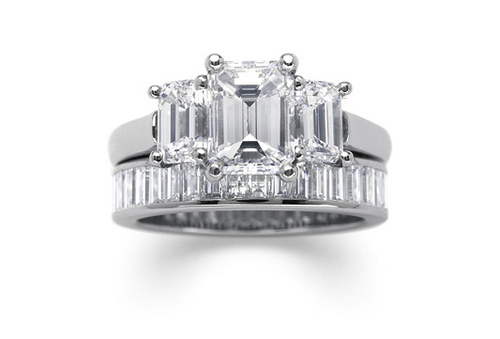 The typical emerald cut diamond ring has a long, narrow shape. It works beautifully in solitaire settings. If there are any accents, they should be small and simple. The great thing about this cut is that it is fairly simple to achieve, especially when compared to other cuts. Despite the cropped corners and the “step” appearance, it’s not that difficult to cut diamonds into this shape. Because of this, these rings are affordable. What emerald cuts lack in brilliance, they make up for in clarity. The cut makes the stone appear clean and pure, like ice. The full depth of the diamond is clearly visible. This type of ring is ideal for a woman who prefers classy over flashy. If it’s poorly cut, the diamond’s flaws are noticeable. However, a wonderfully cut one shows a diamond’s best assets. When choosing an emerald cut, decide on the metal. White gold is typically preferred to yellow gold, since the emerald cut shows off a diamond’s iciness. White gold or silver adds to this theme. Now you know what to look for in an emerald cut diamond ring! This design is ideal for any girl who appreciates class and sophistication. The best place to find the perfect emerald cut is SuperJeweler.com. You can save hundreds of dollars on a gorgeous ring!